My first tennis experience of any kind was watching my brother play in his first official tennis tournament when he was 10 years old. Back then, I couldn't distinguish between a forehand and a backhand, but I learned for the first time what it meant frazzling over a tennis match. More than two years have passed, I got drawn into watching pro tennis and into playing tennis myself, and not only can I now tell a volley from an overhead, I can actually hit both (not too successfully, mind you). 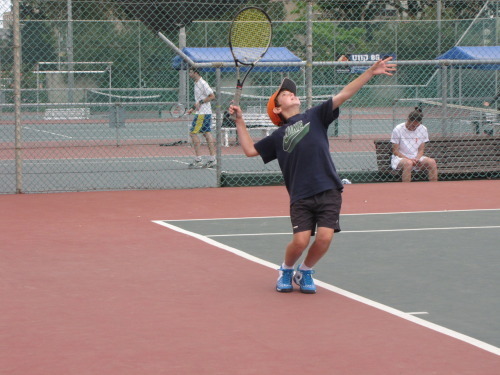 One thing I still love to do more than anything, however, is watch Juniors tennis tournaments. Watching 10, 11, 12 year old kids playing competitive tennis matches is a unique anthropological experience. On one hand, it is very similar to watching real pros play, especially when the kids get a bit older, and can hold long rallies. If you've never seen an under-14 tournament, you might be surprised - the quality of the tennis is often as high as what you're used to seeing on TV. They serve hard, their ground-strokes are well formed, they can hit beautiful winners, they use dropshots and volley well. In fact, I think I've seen all sorts of net exchanges and dropshot-lob combinations more often during junior tournaments than I've seen on TV. At the same time, those are still children. Every emotion is much more pronounced, you're more likely to see frustration - of any kind. They don't usually smash their racquets like the pros (who can afford it), but the younger kids chuck their racquets away readily. The reactions change somewhat with age - in under-12 tournaments, the predominant self-deprecation is "I'm such a loser", two years later it's "That touch is so horrible" or "What is wrong with my backhand?". The youngsters start analyzing their game when they grow older, and instead of a general negative emotion, those are suddenly specific elements of the game that get the blame. The most prominent feature of those tournaments, however, is the way in which the juniors deal with the mental part of the game. They pick up on things they see their idols do, and exaggerate them by several folds. When several matches are going on at once, at any given moment you can hear one out of many cheers of encouragement. Here in Israel, they come at any possible language. "Hal'a", "Kadima" are the Hebrew words that usually precede every service motion, then there are "Come on", "Vamos", "Ajde", "Allez" that punctuate a point being won. Those aren't occasional - they are uttered shouted before and after every single point. As the receiver steps to the baseline, he says "Hal'a, come on" - loudly enough for his opponent to hear. A split second later, just before the server tosses the ball, he reciprocates - "Hal'a, kadima!". As soon as the point is over - no matter if it's a winner or an error, someone has won it, and that someone will "Come on" or "Vamos" straight in his opponent's face. The volume grows louder with the progression of the game, the Vamos following 40-0 will be better heard than the one after the 15-0 point. All of this is, naturally, accompanied by prominent fist pumps. Ana Ivanovic's point-winning reactions will seem insignificant in comparison. Another part of this mental battle is the score calling. As there are no umpires of any kind, the players are supposed to call their score before each serve. What mostly happens, however, is that the first player to shout the score is the one who happens to lead in the game. "0-15, come on, allez," you'll hear from the receiver. Two points later, it's the server who raises his voice - "30-15, kadima, yalla". You missed your first serve? "SECOND," your opponent would kindly let you know. And make no mistake - every error will be cheered, be it a double, a ball in the net or a return that sailed too long. In a way, this forces the juniors to develop a mental toughness much earlier than you would expect. Not only do they need to handle their own mistakes and bad play, they must also withstand those attempts to make them more nervous than they already are. All of this creates a very special environment during the earlier stages of tournaments. As you sit and watch one match, the cacophony of multi-language cheers joins the sounds of tennis balls being hit all around the grounds. Add the occasional grunt of a girl who can rival Sharapova's finest moments, and for a moment you could forget that the players in front of you are only 12 years of age. P.S. And my brother? He won today, 4-6 7-5 and 11-9 in the 3rd set super-tiebreak, after trailing 1-7. I couldn't be prouder. that's a very good analysis about the mental game during th e match play.